The Northern Territory government has responded to questions regarding the legitimacy of Lottoland’s licence and it’s not looking good for the online lottery site. We recently reported that the Communications Minister, Mitch Fifield, wrote to the Northern Territory government questioning how Lottoland obtained an operating license. According to NT News, Attorney-General Natasha Fyles, revealed that the former Country Liberal Party (CLP) government approved the Lottoland licence in the NT. “The Territory Labor Government takes online gambling regulation very seriously and we aim to provide a strong regulatory framework for the sports bookmaking industry,” Ms Fyles said. The lottery betting company has caused a stir since it first entered the gambling market with a licence from the Northern Territory in 2016. As punters bet on the outcome of lotteries in Australia and overseas, Lottoland is a bookmaker. It pays $500,000 per year for the NT licence, which may be reviewed given the lacklustre response from the Attorney-General. Recently, politicians have increased their efforts in getting Lottoland, and similar online lottery betting sites banned. Tatts has even launched a “Lottoland’s Gotta Go!” campaign which claims that Lottoland is threatening the 3000+ independent newsagents. Several people have commented on Lottoland’s Facebook wall, stating that they will be purchasing tickets with official lottery operators only since they pay tax. “The claim is that Lottoland does not pay any Lottery taxes – this is completely true as we are not a Lottery operator, but again an online bookmaker and therefore do not have any lottery taxes to pay in that regard,” the company states on its Facebook wall. “We do however pay GST, Corporate and Income tax just like everybody else and must comply to the Northern Territory government legislation where we are licensed. Former Northern Territory CLP, chief minister Paul Everingham, who is spearheading the campaign against Lottoland, said the NT licence enables the operator to rip Australians off. “The lotteries that I’m speaking for, they’re about putting money back into the community,” he said. “The thing about the Territory is it’s unfair to the rest of Australia that it’s left to be used as a base for these lottery enterprises. Mr Everingham added that the country should lobby the NT government to ban the company. 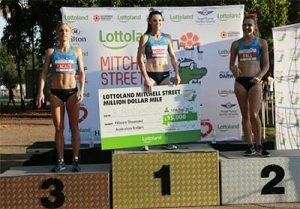 Lottoland recently sponsored the Mitchell Street Mile and donated $25,000 to the event as well as $25 per entrant. The online betting site also contributed $50,000 to the Royal Flying Doctor Service of Australia​, while giving competitors the chance to win $15,000. But Senator Nick Xenophon and One Nation Leader, Pauline Hanson, have slammed Lottoland, claiming the online bookmaker deprives state governments of revenues, as well as independent newsagents. Lottoland is currently offering Australians the chance to be involved in the $AUD620 million US MegaMillions draw. Players can bet on the outcome of the draw, similar to betting on a game of sport, by creating an account. It is important to note the jackpot is split between the number of winners in the main draw. You can opt for the Number Shield option, which will give you access to the full amount.